A canner used to cook, sterilize and preserve high acid foods that are to be canned for future use. 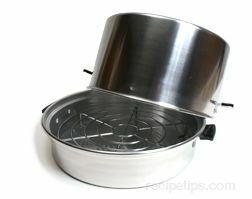 The steam canner consists of a water pan, a jar rack and a dome steam cover. 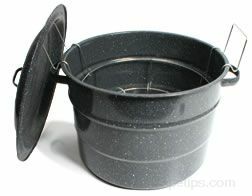 6 to 8 cups of water are placed in the water pan and the jar rack is placed in the pan. The canning jars are placed on the rack and the dome cover is placed over the jars. The water is heated to a boil and when the steam is escaping from the vent holes on the side of the cover the processing time begins. The manufacturers of the steam canners indicated that food is processed for the same time as when using a boiling-water-bath canner. 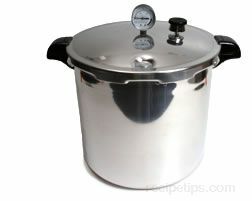 As with the boiling-water-bath canner, only high acid foods should be processed in a steam canner. It should be noted that even though you will find these canners out on the market, the National Center of Home Food Preservation does not recommend using them for food preservation using the same processing times as the boiling-water-bath canners. Because they do not heat to as high a temperature at the beginning and end of the processing, it is felt that using the same processing time as the boiling-water-bath canner is not sufficient. There has not been enough research done to know what the adequate processing times actually are when using a steam canner. 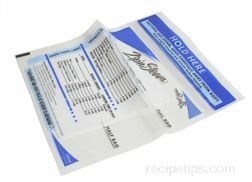 If the food is under processed, it would be susceptible to spoilage.